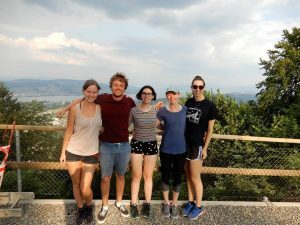 For two weeks in July, five Australian PhD candidates from SASP took part in the 2018 EASP Zurich summer school. 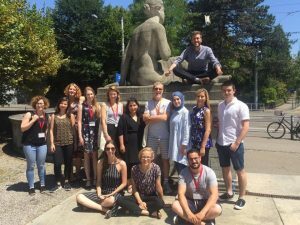 The summer school was a unique opportunity for us to develop not only our own research skills and knowledge, but to collaborate with other aspiring researchers from across the globe. 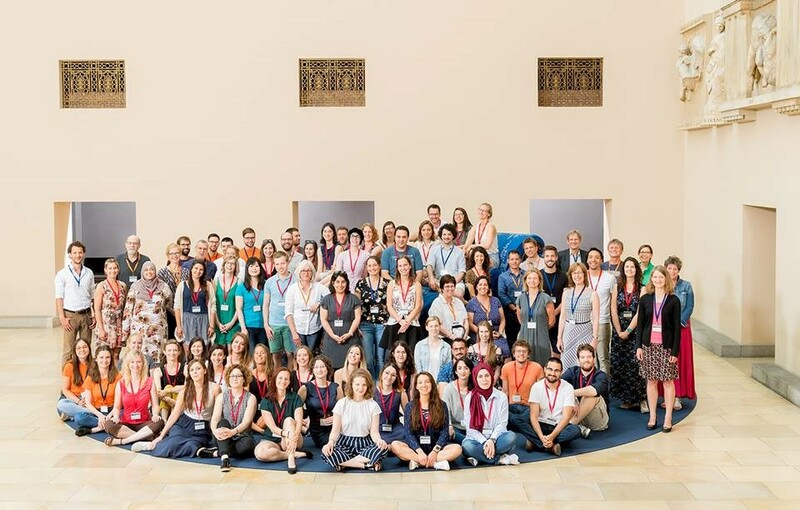 Being surrounding by 60 international researchers all passionate about the future of social psychology was an invaluable experience, building strong foundations for both personal and professional connections. 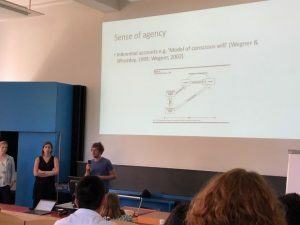 From brainstorming and planning large-scale collaborative projects, to listening to interesting plenary lectures from renowned social psychologists and experiencing the culture of Switzerland, this summer school had it all. 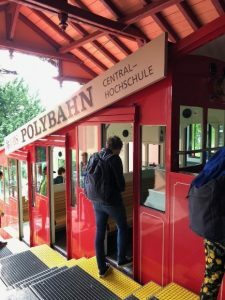 Most of our time in Zurich was dedicated to participating in intensive workshops focusing on one main issue or emerging area in psychology (details of these workshops are below). However, the organisers of the summer school went to exceptional lengths to ensure that it was an all-round, immersive experience. Some highlights included hiking up Uetliberg— a mountain in the Swiss plateau — and enjoying a feast at the top, watching the soccer world cup with summer school participants cheering for 20 different countries, sampling Swiss chocolate on the Limmat river and ending the summer school with a fantastic farewell party on the shores of Lake Zurich. Our hosts at the University of Zürich were amazingly hospitable and made every effort to make us feel welcome. We would like to express our gratitude to all the organisers; from providing us with rail passes and food vouchers, to organising museum tours and guest lectures, they truly made the summer school an unforgettable experience. I participated in the “Social relationships, health, and well-being” workshop, which was led by two excellent teachers from the University of California Irvine: Karen Rook and Dara Sorkin. Over the course of the first week we explored the existing literature on social relationships, social support, and the impact on health and well-being. All the students who participated in this workshop had diverse backgrounds and brought interesting perspectives to the discussion. As a result, although much of the literature we explored focused on dyadic social relationships, our discussions were never limited in terms of implications and relevance to other forms of relationships (e.g., intergroup and human-AI relations). During the second week of the summer school we broke into three smaller groups to work on developing a research project. My group (myself, Maria Alonso Ferres, Lisanne Pauw, and Sanaz Talaifar) chose to investigate the role of similarity of support needs as a predictor of beneficial social support. Other projects developed by members of our workshop aimed to investigate (1) factors that influence perceived loneliness among young people and (2) the impact of social support on the relationship between ostracism and self-dehumanisation. The diversity of these projects provides a glimpse of the range of topics that were explored over the course of summer school, both during and outside of the workshop. I took part in the ‘Migration and integration: Social and community psychology perspectives’ workshop, led by Rupert Brown and Carolin Hagelskamp, along with 11 other social psychology enthusiasts. Not long after initially introducing ourselves did we realise that we had a unique research opportunity, with 12 different nationalities being represented by our participants. This realisation sparked a near obsession with trying to understand how people construct their different identities. We wondered how people subjectively experience and combine their unique national, ethnic, and religious identities into a multiple identity, in different societies across the globe. With the dynamic teaching duo of Carolin and Rupert, we attempted to combine both intergroup and community psychology perspectives into one large research project to answer this question. We focused on the conceptualization and measurement of multiple identities, as well as its contextual- and individual-level predictors, and the social and individual consequences of adopting such complex identity structures. We compiled our research project, complete with the theoretical framework, methodological procedures and hypotheses, into one large proposal and presented it to the summer school. Even 6 months after leaving Zurich, our group continues to collaborate on this ambitious cross-national project. We were successful applicants of the EASP Seedcorn Grant and are committed to understanding multiple identities in different contexts. Zurich enabled us to create a concrete research proposal and establish connections that has led to an ongoing global collaboration, tackling pressing issues in social and community psychology. The workshop I participated in was ‘Motivation and control’, taught by Ruud Custers and Baruch Eitam. Not having a background in cognitive psychology, the preparatory materials that Ruud and Baruch had assigned us before the summer school provided me with an invaluable crash course in new methods, theory, and literature. In particular, it was great to get an up-to-date picture of concepts relating to automaticity, agency, and different theories of motivation. The first week involved us presenting our own research projects to the group, discussing issues relating to open science, and talking through the assigned readings. The past literature sparked interesting conversations, which Ruud and Baruch were happy to facilitate (they had great chemistry as a teaching team). In the second week, we split up into smaller groups to brainstorm different research project. The aim was to use the theories we had been discussing in week one to address social psychological problems and generate research questions that were both theoretically rigorous and practical. Groups in the workshop focused on understanding a sense of agency, namely whether it is affected when achieving a goal by refraining from action, and whether it is affected equally when an action ‘overshoots’ or ‘undershoots’ a target. My group (Maria Babinska, Jasmin Richter, and myself) investigated whether sense of agency in coordinated group action is affected by social identification with the group. This idea kept us up at night, but by the end of the week, we were happy with our proposed methodology and presented our project to the whole summer school. 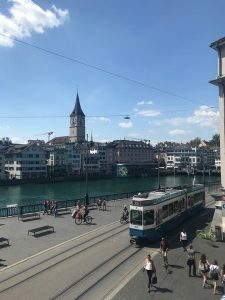 Although we were only in Zürich for two weeks, it felt like we had a whole year’s worth of learning, thinking, and experiencing. I feel privileged to have been part of such a stimulating and energising summer school. I took part in the ‘Building and Testing Theories’ workshop, run by Barry Markovsky and Klaus Fiedler. The first few days were a major learning experience, with Barry and Klaus taking turns to teach us methods of theory analysis, theory construction, logic and argument structure. We discussed and debated popular concepts in social and cognitive psychology, using our new research skills to identify logical fallacies and theoretical problems. We were all surprised at the lack of logical consistency in even established theories that appeared very robust. After acquiring these skills, Barry encouraged us to choose a single theoretical text and identify basic logical propositions and terminologies within the theory. Although Barry had not intended this exercise to be the starting point for our final projects, we were all soon so absorbed in our theory analyses that we decided to design experiments to address the logical inconsistences we found. 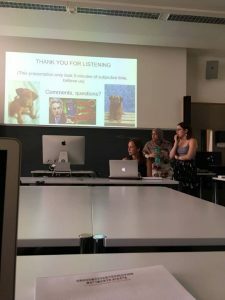 There were four final projects in this workshop, with projects dissecting Social Identity Theory, trust, and Shared Reality Theory. My group focused on a popular model in the time perception literature – the internal clock model (Treisman, 1963). Although this model seems to explain how people perceive time, a deeper investigation revealed logical inconsistencies in the model’s structure and the assumptions underlying it. As a result, we decided to search for a more parsimonious theoretical explanation of time perception. Based on two psychophysical laws, and on other perception research, we proposed a new mathematical model explaining subjective time as a function of real time and the frequency of cues in our environment. I had never previously considered the importance of theoretical implications or logical consistency and can honestly say this workshop changed the way I approach both conducting and evaluating research. I don’t think we can express the extent of gratitude we feel towards the organisers of this amazing event, or towards Barry and Klaus for their guidance and support. I took part in the “Gender stereotypes as consequence and cause of gender inequality”, led by Sabine Sczesny and Alice Eagly, and consisting of 12 talented individuals from Europe, Australia and the US. In the first week we explored topics such as the underlying mechanisms, origins, content, accuracy, and consequences of gender stereotypes, and interventions aimed to target such stereotypes. Due to the broad range of expertise, and the diverse cultural background of our group, the discussions were varied and stimulating. Sabine was able, through her competence and warmth, to moderate the discussion and keep us on track. Over coffee and cookies, we disagreed and agreed with each other during one intense but fun week. At the end of the 1st week, we split into 3 groups to work on respective research ideas. Unfortunately, our second workshop leader, Alice Eagly, was not able to attend the workshop in person due to unforeseeable circumstances. She was nevertheless able to guide us in our endeavours and provided us with her expertise over Skype during the second week. On the last day, we presented our research ideas to the other summer school participants, lecturers and organisers. Our final project focused on the notion that when it comes to mobilising widespread support for reducing gender disparities, the exclusive focus on gender equity as a women’s issue might prevent equity-promoting efforts from having the broadest possible base of support. We propose that framing gender inequity as a problem for both women and men will increase men’s support for gender equity policies. We are all extremely grateful to Sabine Sczesny and Alice Eagly for guiding us through this challenging but rewarding exercise!